We have been benchtop testing with enzymatic biodiesel, evaluating it’s performance with different feedstocks and mixture ratios to see what works best. So far, I’m impressed with the results and it appears to be far easier to use than I originally understood. We have begun investigating what the upfit costs would be to scale up for production, but the ROI looks promising. Not only would we be able to use a wider range of feedstocks, but the pre-treatment time is cut dramatically, input chemicals are cut dramatically, and our production yields look like they might double. All very promising. I’ve been down this road before, skipping down what looks to be a yellow brick road and then have a bunch of flying monkeys swoop down and steal my favorite dog. So, we proceed cautiously, but overall we are excited about the prospect of using a new technology that could potentially increase yields and profit. This may be the most common mistake I still hear after 10 years making biodiesel from vegetable oil using transesterification. Transesterification is the fancy name for the chemical process used to chemically break a triglyceride molecule down and turn it into a methyl-ester (the chemical name for biodiesel) and glycerol. In 2015, I still have conversations where someone tells me they used to “make biodiesel” by mixing used cooking oil and gasoline and pouring it in their diesel truck. Not only is that concoction NOT biodiesel, it’s not good for your engine, or even your fuel tank. It WILL ruin your car or truck. Don’t do it. Nope, it’s not. That’s Ethanol. Unless you mean corn oil, but even that isn’t used very much in the biodiesel industry. Ethanol is usually made from starches or sugar, which are broken down with enzymes, yeast, and fermentation into ethyl alcohol. Biodiesel is ALWAYS made from fats, any fat, but not from sugar or starches like corn. Common oils used commercially for producing biodiesel are soybean, canola, palm, jatropha, and used cooking oil. Really, it won’t. Well, maybe, it depends… It got more complicated around 2009 with the EPA’s ruling to require engine manufacturers to use mechanical and urea based systems to reduce harmful emissions in diesel engines. These changes, specifically DPF (diesel particulate filters) and urea additive systems can cause compatibility problems with high concentrations of biodiesel (above B20). All diesel cars and trucks can at least handle blends of 5% biodiesel (B5) or less. Most cars and trucks before 2007 are usually fine for blends up to B100, but after that you should check with your manufacturer to find out if your diesel car or truck can handle biodiesel blends above B5. 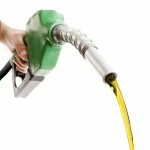 Biodiesel is usually cheaper than diesel fuel. The government instituted a biodiesel tax credit for producers starting in 2004 to help make biodiesel more cost competitive with diesel fuel (which has subsidies already built in the tax code). Because biodiesel is usually cheaper, and often because it is mandated for blending, petroleum companies regularly buy biodiesel in bulk for blending with regular diesel fuel in order to improve profits and take advantage of some of the beneficial properties of biodiesel in their fuel (like increased cetane and lubricity). In fact, many times that diesel you are buying at the truck stop or convenience store is already a B5 or less blend, it just isn’t labeled as such. Biodiesel is a certified fuel by the EPA and the ASTM. That means that when used properly, it is compatible with any modern engine that is on the road today. It also means you can use B20 biodiesel this week, then next week fill up with regular diesel, and next month use B5 biodiesel, and so on. You can be a dedicated biodiesel enthusiast, or you can be a philanderer and switch back and forth as often as you wish. It’s your choice. Your engine won’t care. Really. 32 Senators Sent a Letter to EPA on Biodiesel Volumes: Sens. Heidi Heitkamp (D-ND), Roy Blunt (R-Mo. ), Chuck Grassley (R-Iowa) and Patty Murray (D-Wash.) led a letter sent Monday urging EPA to quickly approve strong biodiesel volumes under the Renewable Fuel Standard (RFS) for 2014, 2015 and 2016. Yes, you read that right. The US EPA still hasn’t set the volume requirements for the Renewable Fuel Standard for last year. Last year. Pointing to an industry survey, lawmakers said that nearly 80 percent of U.S. biodiesel producers had scaled back production last year, and that about 60 percent quit production altogether. Additionally, about 66 percent of biodiesel producers said they have already reduced or anticipate reducing their workforce. The EPA has said it expects to set the standards for 2014 and 2015 some time this year. TBI was idle for 2 months at the end of 2014 due to lack of the biodiesel tax credit and a lack of guidance from the EPA on the RFS volumes for biodiesel. With the tax credit retroactively renewed for 2014, we are back in production for 2015. We are once again producing SME and FAME biodiesel for bulk blenders, fleets, and retail sales in blends of B99 or B20. Other custom blends are available upon request. We thank you for your continued support of Triangle Biofuels and look forward to a productive year in 2015. Triangle Biofuels Industries (Wilson, NC), the largest biodiesel plant in North Carolina, was featured in the July 29th airing of “Off Limits” with Don Wildman. The segment features the oil collection process, biodiesel production, and dispensing of biodiesel made from used cooking oil. Also featured is an excellent animation about the biodiesel reaction process which shows how vegetable oil is turned into biodiesel and glycerin, and how the finished biofuel is processed. After numerous articles in the media about small (and sometimes large) fires at biodiesel plants, most of the articles I read end up saying something about how the fire department was ill-prepared or unsure about what chemicals were in the plant and whether they were hazardous. In some cases, they even questioned whether the biodiesel itself was hazardous. I’m not a firefighting expert, nor a chemist, but I’m going to attempt to explain in layman’s terms what can be found at the typical biodiesel plant and a little bit about each. Vegetable Oil – Health:1, Fire:1, Reactivity:1. Any type oil, soybean, canola, waste vegetable. These oils are non-hazardous, non-toxic, and non-flammable. Flash point is well over 450°F. Most biodiesel plants will store vegetable oil in bulk tanks, but it may also be found in 300 gal IBC totes. Treat as oil fire. Foam, dry chemical, CO2, or water if necessary. Water on oil fires is a last resort, as it tends to spread the oil (and thus the fire), and in some cases can actually flash to steam and create a more dangerous situation. Potential fire sources in biodiesel plants are caused by using electric heating elements directly exposed to vegetable oil with lack of stirring or overheating. Biodiesel – Health:1, Fire:1, Reactivity:1. Chemical name Mono-Alkyl Ester. Non-hazardous, non-toxic, and non-flammable. CAS Number 67784-80-9. Flash point typically over 300°F. Treat as oil fire. Foam, dry chemical, CO2, or water if necessary. Use water spray, fog or foam. Do not use water jet. 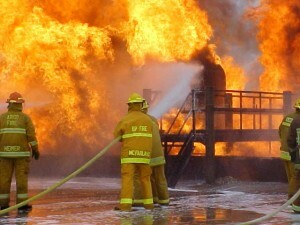 Water on oil fires is a last resort, as it tends to spread the oil (and thus the fire), and in some cases can actually flash to steam and create a more dangerous situation. Disbursement into ravines or water sources can be immediately threatening to wildlife in some cases (oil film on water surface, oxygen reducer), but researchers at the University of Idaho noted that after leaving biodiesel in an aqueous solution for twenty-eight days, ninety-five percent of biodiesel was gone—completely degraded. Potential fire sources in biodiesel plants are caused by using electric heating elements directly exposed to biodiesel with lack of stirring or overheating. In certain cases (in process biodiesel production) methanol may be added to the biodiesel, reducing the flash point and making a hazardous material. Glycerin – Health:1, Fire:1, Reactivity:0. Chemical name propane-1,2,3-triol. CAS Number: 8043-29-6. Pure glycerin is a non-flammable and non-hazardous material. Depending upon the feestock and purity, it can contain methanol, lipids (vegetable oil), and water. In these cases the material may be considered slightly hazardous and flammable. It is slightly hazardous in case of skin contact (irritant, permeator over long contact duration), of eye contact (irritant), of ingestion, of inhalation. Flash point for pure glycerin is 320°F, but methylated glycerin can be much lower. Most biodiesel plans will have both raw (with methanol) and finished (pure or near pure) glycerin. All but refined glycerin will have a brownish to dark black color and syrup like viscosity. It may be stored in barrels, 300 gallon IBC totes, or in bulk tanks. Treat as oil fire. Foam, dry chemical, CO2, or water if necessary. Use water spray, fog or foam. Do not use water jet. Glycerin is heavier than water and runoff into ditches, streams, and ponds may not be immediately visible because the material may be on the bottom. Methanol – Health:3, Fire:3, Reactivity:1. Chemical name: Methyl Alcohol. CAS Number: 67-56-1. Methanol is highly flammable, toxic, and hazardous. It burns with a light blue flame, almost invisible during daylight. Flash point is 54°F. Most biodiesel plants will have pure methanol. It may be stored in barrels, 300 IBC gallon totes, or bulk tanks. Treat as oil fire. Foam, dry chemical, CO2, or water if necessary. Use water spray, fog or foam. Do not use water jet. All pumps and motors involved in production for methanol related materials should be explosion proof. Sodium Methoxide or Sodium Methylate – Health:3, Fire:3, Reactivity:3. CAS Number: 124-41-4. Definitely the most dangerous material at a biodiesel plant. Some biodiesel plants may use Potassium Methylate in addition or instead (treat similarly). This material will be in liquid form, and has a clear, viscous appearance. Flash point is 91°F. Treat as oil fire. Foam, dry chemical, CO2, or water if necessary. Use water spray, fog or foam. Do not use water jet. Highly flammable and autoignition possible in presence of moisture. Flammable in presence of open flames and sparks, or heat. Most small to medium sized biodiesel plants have this in small quantities, usually stored in drums or 300 gal IBC totes. Some larger plants will store this in bulk tanks, which are usually stainless steel. This material is highly reactive, caustic, hazardous and toxic. Avoid contact with skin, inhalation, and exposure to eyes. Do not flush caustic residues to sewer. Residues from spills can be diluted with water, neutralized with diluted acid such as acetic and hydrochloric. Absorb neutralized caustic residues on clay, sand, vermiculite or other absorbent material and place in a chemical waste container for disposal. Sodium Hydroxide – Health:3, Fire:1, Reactivity:2. CAS number: 1310−73−2 100. Some biodiesel plants may use Potassium Hydroxide in addition or instead (treat similarly). Corrosive, causes severe burns. This is a corrosive solid that has a physical appearance of white flakes or white granules. It is highly toxic and hazardous. It is commonly stored in drums and 55 lb plastic bags (like potting soil). Most small to medium sized plants will have 2,000 to 10,000 lbs on hand at a time. Avoid contact with skin, inhalation, and exposure to eyes. Sodium hydroxide is slightly toxic in the aquatic environment. The toxic effect on aquatic organism is due pH increasing. It is soluble in water and degrades quickly. Not considered a fire hazard; however, for large fire use powder, foam extinguishing agents or carbon dioxide. Avoid water use if possible. Adding water to caustic solution generates large amounts of heat and steam! Do not flush caustic residues to sewer. Residues from spills can be diluted with water, neutralized with diluted acid such as acetic and hydrochloric. Absorb neutralized caustic residues on clay, sand, vermiculite or other absorbent material and place in a chemical waste container for disposal. While this is certainly not an exhaustive list of materials found at biodiesel plants, it contains the primary components that nearly every biodiesel plant in the Unites States uses on a daily basis. 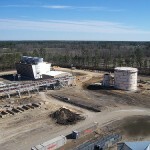 Our plant is located in the city of Wilson, NC and we regularly have visits and familiarization drills with the firefighters in the town to acquaint them with the materials we use in our plant, and where they are stored. These drills become invaluable when the need arises in order to minimize the potential danger to the firefighters and the community should disaster strike. This time of year we always see a surge in cities and counties contacting us to collect or receive their used cooking oil. Many people these days deep fry their turkey for Thanksgiving. It’s a quick, tasty way to cook a large turkey. I’ll leave it to the culinary experts to tell you how to best fry and serve the turkey on this day, but I want to share a few tips and ideas about the grease that comes from this collective holiday ritual. It started for us about 3 years ago. We had calls from several cities a few months before Thanksgiving asking us if we would accept their cooking oil. We said yes. For some municipalities, it even turned into a curbside collection program where the city would pickup your grease (in sealed containers) from your house during the normal trash pickup. We started placing special collection bins at municipal and county waste collection locations. Now, picking up used cooking oil from a government entity isn’t a simple and trivial process. Most of them want a contract, which clearly states that we have insurance and other commitments to ensure that we will do what we say we’ll do, and transfer the liability to someone else if something bad happens. That’s just the nature of today’s society and working with any government entity. You will see these programs labeled as “Municipal Curbside Grease Collection Programs” or “WVO Recycling Programs”. WVO (waste vegetable oil) and UCO (used cooking oil) can be used interchangeably and are often just stated as “grease” or “used oil”. Many times you will see WVO collected at the city or county hazardous waste facility, even though technically WVO is not hazardous waste (it is food, after all). Mostly they are put at hazmat collection sites because they don’t have anywhere else suitable to contain it, and those sites are used to handling liquids that can be a bit messy. But why do these cities and counties want to sell me their grease? It doesn’t pay that much. In fact, the money we pay for the grease probably barely pays to offset the fuel and labor it takes to pick the oil up and transport it back to the recycling site (although we do sell biodiesel back at a discount to some which further enhances the savings). No, the real reason is FOG. Not the London type, it stands for Fats, Oils, and Greases. It’s nasty stuff. It happens when people pour grease down their drains or in the sewer. Fats, oils and greases that are liquids at high temperatures cool and become solids. When they cool, it clogs up the drains or sewers, and creates backup issues that can create huge financial problems for people and businesses when their business or street floods with water and sewer. It’s nasty, it’s costly, and it’s a potential health concern. There’s a special kind of truck, maybe you’ve seen them, called a “Jetter” that’s used to clean up this mess. These highly specialized trucks have a pumping system similar to a fire truck that uses very high pressure hot water to clear out the drain. In some cases, actually sucking the muck out into another tank so it can be dumped at a proper waste handling facility that is designed to process fats and oils. It’s a nasty job worthy of a “Dirty Jobs” episode all by itself (in fact, they did a sewer clean out episode, I think). So really, the entire “UCO Recycling program” is to prevent FOG. It saves labor, time, and money, and it prevents very costly and potentially catastrophic sewer backups. Plus, the city or county is improving their recycling program and benefits by looking “green”. In some cases they actually are “green” because the biodiesel we produce from those oils is sold back to that group as biodiesel, which is used in their trucks and buses to reduce diesel exhaust emissions. So in effect, the turkey you fry this Thanksgiving not only tastes good, it’s potentially helping to provide cleaner air for the city and county you live in. That’s something to be pretty thankful for indeed. After frying your turkey (or whatever), cover the cooker with the lid and allow it to cool for several hours, or until the temperature is at least below 110°F. If possible, find the original container the oil came in. These containers are usually plastic with a screw on top and are perfect for storing oil. Otherwise, find a suitable container that can hold the oil in an airtight and spill proof manner. Using a funnel, pour the oil into the container, getting as much as possible from the fryer into the container. Seal the container with the lid, and if necessary, use electrical tape or masking tape around the lid to ensure the lid will not come off accidentally. IMPORTANT: Label the container as “Used Cooking Oil” on several sides in permanent marker. With paper towels, wipe the inside of the fryer to get any residual oil and fryer bits, and wipe off any excess around the fryer oil container that may have spilled during transfer. Discard the paper towels in your trash. Some people burn them in the fireplace as kindling, but we don’t necessarily recommend that because it’s messy and can create an oily smoke that is not healthy to breathe. If your city has a curbside collection program, you may need to contact them in advance and tell them you have grease to pick up. Some cities have a minimum amount to pickup, so ask. Otherwise, place at your curbside where it will be seen during your normal trash or recycling pickup. If you don’t have curbside pickup, simply take it to your city or county recycling or hazardous waste facility for recycling there. You can also drop it off at our facility in Wilson if that’s convenient (see our contact page on our website for a map). Don’t throw that grease away! It can be recycled and used to help make diesel fumes less toxic to our air! In a multi-part series about biodiesel, this is one of several articles in an attempt to dispel the myths about biodiesel and it’s use in commercial and private diesel engines. Most likely, no. While it’s true the biodiesel has a higher gel point than diesel fuel, the fact is that both petroleum diesel and biodiesel will gel if it gets cold enough. If it’s not very cold, biodiesel will not gel up at all. Biodiesel responds to anti-gel treatments in much the same manner as petroleum diesel. By adding compounds that inhibit wax formations to accumulate, the fuel in effect remains liquid instead of gelling (or waxing) as the temperature decreases. The temperature at which untreated biodiesel gels is variable, just like it is with untreated petroleum diesel. The common temperature at which most people will say untreated diesel will begin to gel is 12°F. The common temperature at which most people agree biodiesel will begin to gel, although it’s largely based upon feedstock so we’re going to assume soy biodiesel, is 30°F. Adding anti-gel compounds significantly lowers that temperature in both fuels. Further, in winter time, diesel fuel not only has anti-gel additives in it, it usually is mixed with #1 Diesel (kerosene) in colder climates. Kerosene is a light fuel oil, which has a gel point of -30°F. Adding it in a 1/20 ratio to biodiesel or a biodiesel blend will further winterize your fuel. However, for most temperate climates, it’s not necessary. Regular B20 biodiesel (with #2 winter diesel) will work just fine down to about -5°F. Always make sure your diesel (and biodiesel) fuel has been winterized in cold weather months, and it wouldn’t hurt to add it yourself just to be sure. It beats being stranded on the side of the road. What do you do if the fuel has already gelled in your tank? You wake up on the morning to go to work and your vehicle will not start. Your fuel has gelled in the tank overnight. What do you do? The time proven remedy is to add a gallon of kerosene for each 10 to 20 gallons of fuel to the tank, then allow it to sit long enough for the kerosene to diffuse into the fuel. In weather below -20 degrees F, one gallon of kerosene for 10 gallons of fuel will keep things moving, but fuel economy will be reduced because kerosene has a lower BTU value per gallon than #2 diesel fuel. Block heaters and tank heaters are also added in severe climates to help ensure fuel is flowing. Store your vehicle in a garage if possible. For more information, visit the NBB website at http://www.biodiesel.org/pdf_files/fuelfactsheets/COLD_BIOGenrlFactShtNOSOY.pdf.